The challenge: In honor of the fast approaching cool, fall weather, what better way to get ready than to find ways to make your wardrobe do double duty. Pick at least one item in your closet (not jeans, that's too easy! ), and create two outfits, one for spring/summer, and one for fall/winter. **Update**: Just in case you're wondering (Twitter friends have already knew about this), I am hosting PFC #3 in October. 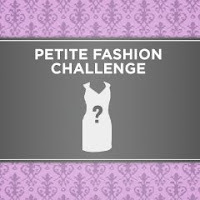 Mark your calendar and join me for a fun challenge. More details will be posted in the near future. I don't think I could pull this look off (tights and shorts) but you rock it! Both looks are very nice, especially like the winter version. The white baby doll top is cute on you. Don't you love the style and material of Express pants/shorts? I was tempted to purchase some shorts during my last visit but I know they will end up sitting in the closet. I love those tweed shorts!! Shorts over tights are one of my new faves for cold weather (tried it for the first time last year) and the final outfit you put together is fantabulous. I saw those booties too from Target. I know what you mean about how they aren't the most comfy. I ended up returning all of my bootie order from there because I wouldn't b e able to walk far in any of them. @ Elle: If you get them, I want to see them on you. I think they'll look fabulous on you since you're a bit taller than me. I looove your winter look. and these shorts. I'm really tempted to go to express and find them haha. You did a great job and look so polished! i love the transformation too! the last outfit is so chic and sophisticated. i'd say its my fave outfit of yours!!! great job! I really like your fall outfit. This fall I plan to wear shorts with tights, too, for the first time. I'm a little nervous (hubby doesn't like the style), so we'll have to see :). The necklace is very pretty. I've always liked the idea of shorts over tights but I wasn't able to find any shorts that fit this summer so can't try that yet. Your cold weather outfit looks very sleek and I really like the lace panel on the side of the shorts. Okay, I have to tell you that you are my favorite for this challenge! Those tweed shorts are so fierce, and paired with that jacket, those opaque tights and booties....shut up!! Love it so much! is that lace on the side of these shorts? I also own the hook belt you're wearing in the 1st picture. I like how I can adjust it! I need to buy more of these. You know...this shorts&sheer tights thing totally works for some people (i.e. YOU! ), but I just cannot do it! My legs look wayyyy too thin in them. Black tights don't help skinny legs look less like chicken legs. sigh. but this outfit is so chic! the booties just tie everything together so well. Great job Sydney! Lovely, lovely. Shorts over tights with booties are definitely one of my favorite looks in the fall. When I saw the shorts, I have to admit I was skeptical about turning them into a fall look. But what you did is FLAWLESS and so stylish! Absolutely gorgeous. @TLDP: How funny! I have those exact same shorts. I worn them in one of my post too. I love how she styled them. Oh so cute. Love how you paired the shorts with a blazer and black tights. Gorgeous. Love the fall look! I love Express and how small some of their sizes go. I've never been brave enough to try shorts over tights but you pull them off so well, I may just have to try it myself! I've been in Express once or twice but never bought anything because the clothes seemed too business-like for me (I'm only 18!) but those shorts are really cute! oo the shorts look totally different between the 2 outfits i love it! Dang you look like a model for Express in the "fall/winter" outfit! It's so pretty and fashionable, yet looks comfy too! Love the necklace you added, it really adds to the ensemble! I LOVE your final look! I like the black tights and just everything looks PERFECT!!! Love those shorts! What a great pick for multi-season styling!